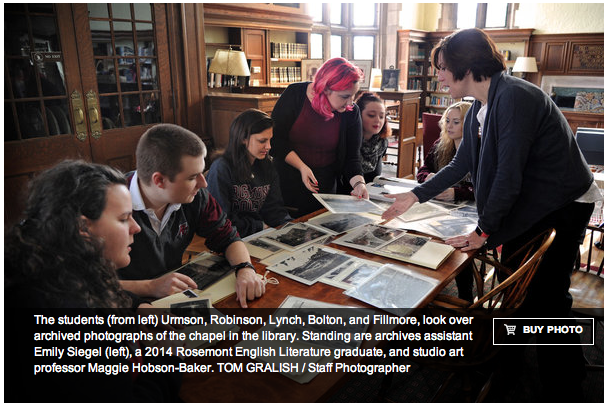 The Education reporter from the Philadelphia Inquirer interviewed members of the Digital Humanities class on Sunday February 7th. Pictures were taken, questions were asked, and quotes were recorded. The interview was all about the history of the chapel and the different elements the chapel consists of. Besides just the chapel itself, the interview was also meant to focus on the 75th anniversary of the chapel, which is on April 17th. During Founders Day, there will be tours of the chapel given out by the Digital Humanities students. As well as in person tours, there will also be a virtual tour primarily of the Saints and stained glass window posted on the chapel website. We hope to see you there!